Click <Category> below to sort news <by Date> according to your interests. The Academy of the Sacred Heart recently welcomed Sr. Hilda Bamwine, RSCJ, who is the current Head of School at the Sacred Heart school in Uganda and Former Provincial of the Province of Africa. During her visit, she met with third and fourth grade students in the Service Learning Club, who are currently planning a service project to raise funds for the Sacred Heart school in Uganda. She discussed her school community, shared pictures, and answered questions over lunch. 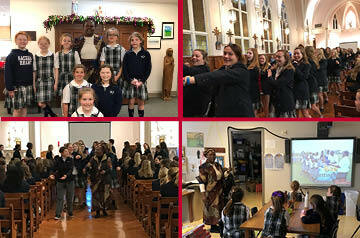 Additionally, Sr. Hilda spoke to students during their respective assembly and chapel times and led them in a traditional Swahili praise song, as well as dance.